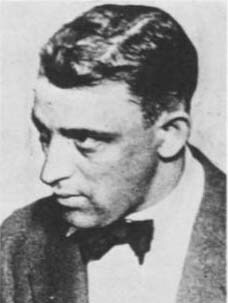 Earl "Hymie" Weiss was a Polish-American gangster who became a leader of the Prohibition-era North Side Gang and a bitter rival of Al Capone. Born Earl Wojciechowski in Chicago on Jan. 25, 1898, he grew up on the North Side. At some point, the family changed its last name to "Weiss." Earl gained the nickname "Hymie" later in his career. Despite the Jewish-sounding moniker, he was a Catholic. As a teenager, Weiss was a petty criminal who befriended an Irish-American teen named Dean O’Banion, another petty criminal. With Weiss and George "Bugs" Moran, O’Banion established the North Side Gang, a criminal organization that eventually controlled bootlegging and other activities in that section of Chicago. After O’Banion’s murder on Nov. 10, 1924, Weiss took command of the North Side Gang and swore to avenge his friend’s death. On Jan. 12, 1925, Weiss and his men were suspected of opening fire on Al Capone’s limousine in front of a South Side restaurant; Capone was not present at the time. Twelve days later, Weiss and Moran ambushed Johnny Torrio, who head the South Side Gang, outside his home. 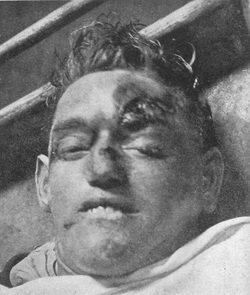 Despite being badly wounded by pistol and shotgun fire, Torrio survived, and the rival gangs squared off for war. 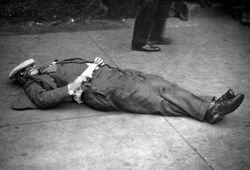 Weiss and his gunmen were also suspected of gunning down Sicilian crime boss Angelo Genna on May 26, 1925. The Gennas were longtime enemies of O’Banion. On Sept. 20, 1926, Capone was having lunch with his bodyguard, Frank Rio, at the Hawthorne Hotel when a caravan of cars rode past and opened fire with multiple machine guns. According to some accounts, the second-to-last car stopped in front of the hotel and a gunman, clad in a khaki Army shirt and brown overalls, approached the hotel’s front door and emptied a machine gun into the room. While Capone survived the attack, this act scared him enough to an attempt a truce. At a peace conference on Oct. 4, 1926, Weiss insisted that the triggermen in the O’Banion murder (John Scalise and Albert Anselmi) be executed. Capone refused Weiss’ terms, and Weiss took more radical means to avenge O'Banion. Weiss was suspected of having formed an alliance with South Side beer baron Joe Saltis, who went on trial for murder in October 1926. It was widely rumored that Weiss would buy off the jury in order to ensure an acquittal for Saltis. Jury selection began on Oct. 11, and Weiss, along with four others, were sighted there. At 4 that afternoon, Weiss and his men left for their State Street headquarters, the old Schofield flower shop where O'Banion had been killed. The quintet were crossing State Street to enter the shop when two gunmen hidden in a nearby rooming house opened fire with a machine gun and shotgun. 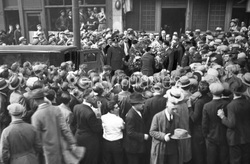 Weiss and Paddy Murray were killed while the other three were wounded, including Weiss' bodyguard and driver Sam Pellar. Bullets from the fusillade chipped the cornerstone of the Holy Name Cathedral directly across the street, where Weiss and O'Banion regularly attended mass. 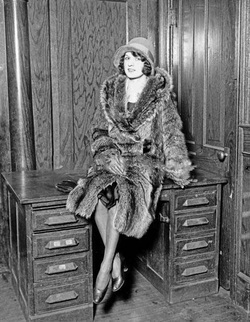 Although often said to have left an estate of $1.3 million dollars, Weiss’ estate was actually calculated at $10,601.78 during a 1927 hearing between his family members and girlfriend Josephine Simard. Weiss' killers were never positively identified, but Chicago police suspected that the machine gunner may have been Jack McGurn, Capones top gunman. It has also been speculated that the man in charge of the hit was Frank Nitti, one of Capone's trusted aides. From 1926 to 1929, Moran took charge of the North Side Gang. During that time, McGurn was especially singled out for repeated attempts on his life, the Northsiders being known for considering "personal scores to settle" of greater importance than regular gang business. Weiss was said to have suffered from "arterial cancer." Not only is that illness extremely rare, it would hardly have been diagnosable in Weiss' era. Given that his symptoms were said to include headaches, dizziness and fainting spells, it is more likely that Weiss was suffering from a pheochromocytoma (a tumor which, by virtue of affecting the circulation, is not totally unrelated to the term "arterial cancer"). Often, he would sleep on a couch on the second floor of the Schofield flower shop. Because of his illness, Weisse often said he didn’t expect to live to an old age, which may explain his fearlessness in fighting his rivals. To this day, it is said that Weiss was the only man Capone ever truly feared. A dapper Weiss at the height of his career. Murray's body awaits picking up. Above is the window, marked by an 'x', from which the gunmen fired. Below is the angle of the bullets that killed Weiss and Murray. South Side beer baron Joe "Pollock" Saltis.